1. Ashima-Leena’s collection is a perfect amalgamation of trends, traditions, textiles and styles. Their collection 'Raag Rattan' brings together the beauty of regal Indian garments of the 18th century with contemporary touches. The collection opened with the white section, gradually moving into brighter shades of light pink, peach and fuschia. Sequins, cut work and beaten gold embroidery, were some of the key embellishments. Net sari with crystal encrusted blouse, asymmetrical bias kurtas paired with net palazzos, paneled skirts with mind length kurtas and shararas were some of the key silhouettes’ seen through the collection.The designer duo have mastered the art of presenting amazing couture and have created a collection perfect for the wedding festivities. 2.‘Jamazeb’ was the collection presented by Meera and Muzaffar Ali's label Kotwara.Staying true to their traditional heritage, the duo added innovations to the fabulous embroidery from Awadh and experimented with chikankari by adding some techniques like zardozi, aari, appliqués and kamdani. Their choice of fabrics was as rich as the creations with velvets and nets blended beautifully to create lacy textures. Cutwork jackets and bodice, sheer coat over sari, shaded black and white gown and saris, halter kurtas and lush lehengas were some of the stand out pieces of the collection.Opening the show with an all-black collection the second half of the show was filled with shades of reds, yellows, oranges and rust, ending the collection with blues and purples. 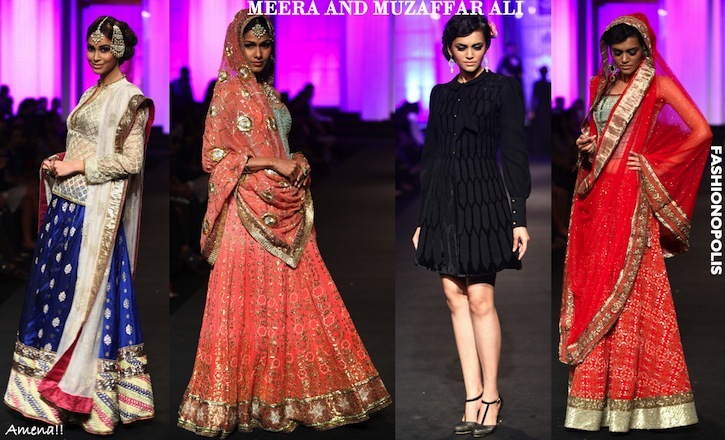 For traditional bridal wear that speaks a beautiful language of craft and style, the ‘Jamazeb’ collection by Meera and Muzaffar Ali offers the perfect choices. What is your ideal bridal look? And which of these ones would best suit you? Share your views with me in the comment section. Great blog! Thanks for sharing you can purchase latest online embroidered party wear sarees from G3 fashions surat.